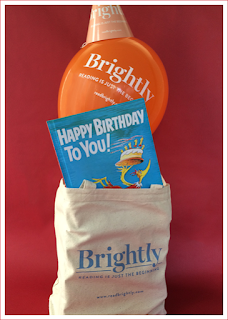 Happy 1st Birthday Brightly! Their goal is to raise life long readers - isn't that fabulous? I know in my home that is one of my most important goals and we make reading a daily thing. By making reading an enjoyable activity I know it creates a love to last a lifetime! One of the things offered on the site is amazing party ideas based off of your favorite books! Ideas for Madeline or Corduroy Bear parties are perfect for getting family and friends together. I love the food, decorations and favor ideas. For me a party is nothing without a good theme and these are perfect go alongs for classic books! Be sure to check out Brightly before planning your next party! Kid Lit Inspired Birthday Party Ideas and much more! Visit ReadBrightly.com for additional information! one lucky reader will win a Birthday Prize Pack from Brightly! Included is a themed tote and birthday book! "The Secret Garden" would be a fun birthday idea. Strega Nonna, or Pancakes, Pancakes by Eric Carle would be fun. I'd love a Cat in the Hat birthday party theme. Thanks for the giveaway! My grandson would like something in a cars and truck theme I bet. I would like to see The Very Hungry Caterpillar. I would love to see Andersen's fairy tales! I'd like to see The Hungry Caterpillar!